BM Transport Ltd. is a family owned road haulage company based in Newbliss, Co. Monaghan. Established in 1991, BM Transport currently employs 45 people, who pride themselves on providing a fast, reliable and cost-effective logistics solution to all our customers and a commitment to the highest standard. 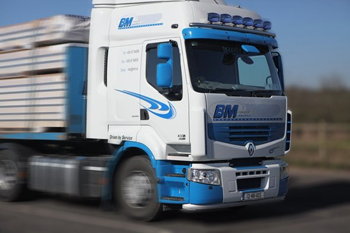 We at BM Transport Ltd tailor our service to your specific needs, by providing flexible transport via a range of modern, up-to-date vehicles and trailers. All our vehicles are fitted with a satellite tracking system providing instant information on the location and progress of your consignment. Please see our Fleet and Freight Service section for further information and a list of transport options. BM Transport Ltd. has built a reputation by providing superb customer services to all of our clients. Please see our Clients and Testimonials section for a selection of our clientele and some testimonials to our unbeatable service.